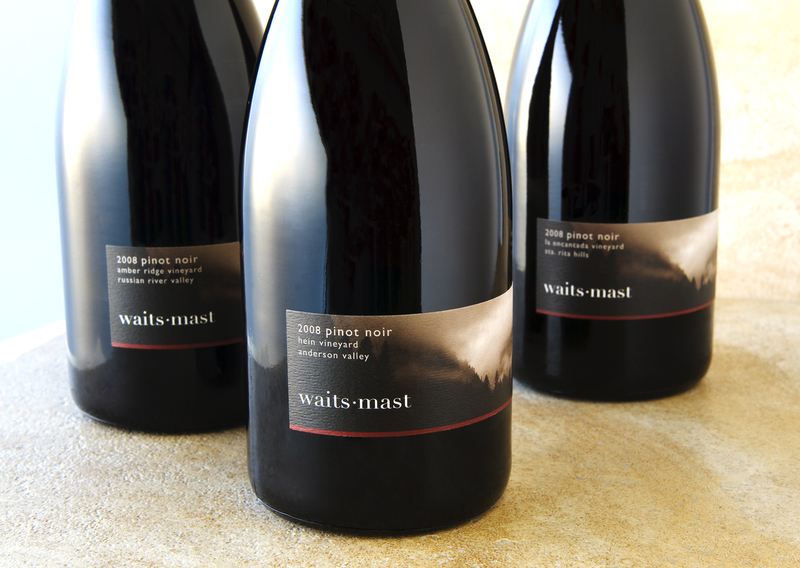 Okay, so now that you have bought that perfect bottle of wine for the holidays (perhaps a Waits-Mast pinot noir? ), you need a cool and fashionable bag to deliver it in. You can get a simple gift bag at the wine shop, but if you really want to up the ante on your present for the wine nut in your life, then here are a few different wine bags worth looking at. For the literary wine lover, we found a very cool bag at small shop in the East Village (well, we weren’t there, we found it online) call Old Village Hall. The Poe Wine Tote is a cotton canvas bag that holds two bottles and has a very cool design featuring a screen print of author Edgar Allan Poe. 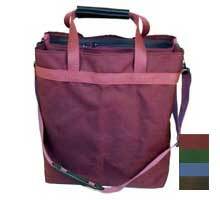 It’s $30 – a nice little price for a hip little wine bag – at www.theoldvillagehall.com. 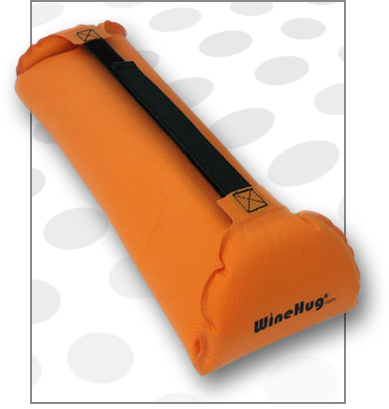 For the wine traveler who likes to pick up a bottle or two to bring home on the plane, check out this inflatable wine bag called WineHug. It self-inflates and protects your wine from the errant baggage-handlers. It’s a bummer that you can’t bring wine on board the airplane with you these days, but at least solutions like this help you bring the vino home in one piece. We found this at Wine Enthusiast for $19.95. Another very protective wine bag that is light and easy to carry to any party are the neoprene wine totes from BUILT. We have the multi-colored Fishnet Wine Tote, which holds two bottles. 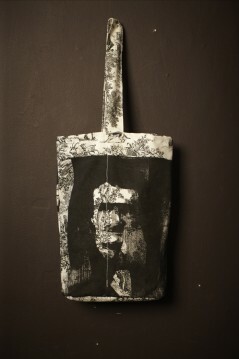 You can find these wine totes at your neighborhood gift shop or online at www.builtny.com. Brian hearts his leather wine carrier that Jennifer got him at Red Envelope for Valentine’s Day a few years ago. He uses it all the time – from taking that special bottle to a restaurant to toting some of our own wine to our daughter’s preschool holiday party (hey, gotta mix it up a bit!). They don’t have the same one at Red Envelope, but they have another very nice chocolate brown leather two-bottle wine carrier for $99.95. It’s definitely the upscale choice in the mix here, but for that special someone, it is a luxurious gift to find under the tree. And lastly, for the winemaker in your life (hint, hint! 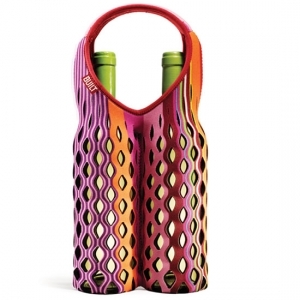 ), a very practical and (literally) cool wine carrier can be found at Chill ‘N Go. Our friends at Troll Bridge Cellars turned us on to this bag. It is very handy when driving around town for sales appointments and keeping your wine at a properly chilled temperature. The bag, which comes in 1-, 2-, 4- and 6-pack options, includes a center compartment that has a chill pack that you keep in the freezer and then slip into the bag when you’re ready to hit the road. And you can personalize it with a monogram or your winery logo. They are kind of hard to find, but check out Wine Exchange to buy them online. Remember to check out your local wine shop or even winery tasting room, who often have interesting options for wine bags and other accessories. And if you are still on the hunt for that perfect bottle of pinot noir, check out our holiday gift guide for pinot noir lovers. And our holiday specials are still available through December 31, so check them out here. To see the reviews on Wine Enthusiast’s website, click here. We’re very excited about these reviews and Heimoff does a great job of describing the flavors in these wines. They are also in short supply – we have about nine cases of the La Encantada and four cases of the Amber Ridge left in stock, so get ’em while you can!